Jet-lag update....woke up early but felt rested, so must be making progress! After breakfast (had an omelet again!) our driver and guide picked us up for the trip back to Guilin. Because the holiday week the first week of October is a national holiday) is winding down there is a lot of traffic on this main two-lane road back to Guilin. It is amazing that there aren't more accidents because the drivers (truck, cars, vans, buses, mopeds, bikers .... anything on wheels) use any open space on the two lane road to get ahead of the vehicle in front of them. There is a lane on the right that is allocated for bikers and motorbikes and smaller vehicles that you only see in China. Trucks, cars and any other vehicle use that lane as well as the oncoming traffic lane to pass. After about an hour we came to an agricultural demonstration village, referred to as Paradise, that emphasized the farming lifestyle of one of the many minorities in this area, the Dongs. This village is totally self sustaining and demonstrated the lifestyle back in time through today. 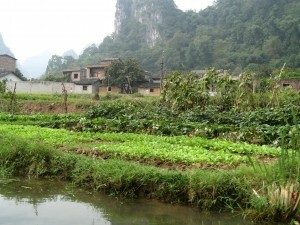 We got on a boat and passed all the different fields of crops and animals that support the village. Back on the road, it was interesting to see how all of the available land is used to raise the great variety of crops. In this area it was predominantly fruit, pomelo's, are very large green fruit that has a meat similar to the grapefruit, but not as juicy or sweet. Many rice fields were mixed in with the fru it orchards. 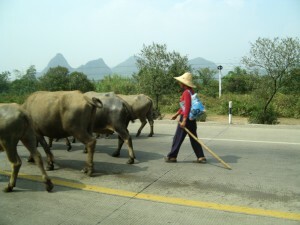 Motorized vehicles are not the only traffic we encountered on the way into Guilin. How about a herd of water buffalo? Yes right down the middle of the road, followed by the herder (I don't know if they have a special name). It was sort of cool to see the old with the new and how the new gave way. Before heading for the hotel our driver and guide took us to the Ludi Yan Cave (Reed Flute, because some of the formations resemble somewhat the shape of reed flutes). These caves were discovered a long time ago, used as an air raid shelter during the war with Japan and just recently reopened to the public. The downside to these caves is that too many people are allowed in and as a result formation of new stalagmites and stalactites has almost stopped due to the spoiling of the air and touching. They have illuminated the formations with colored fluorescent lights and the pools of water reflecting the formations are quite effective. 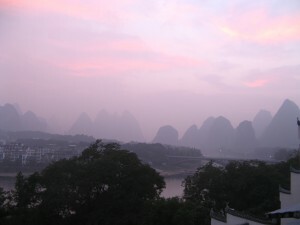 We arrived in Guilin and had a couple pots of coffee while we waited for our room to become available. It was nice to be able to relax (nap) for a little bit before we headed out to see a couple of sites in the city that are popular tourist attraction. The first was the Elephant Trunk Hill, named because it appears as an elephant drinking from the river. This has become the symbol of the city according to the guidebook. We casually walked around all sides of the 'elephant', people watching, taking pictures, walking through a small bamboo grove, a small Buddhist temple, and having fun reading the 'keep off the grass' translations. The next were the Sun and Moon pagodas that are alongside the Zhongshan River. They are twin 130 foot tall pagodas. Pagodas were a development out of the India stupa and developed by the Chinese into their current structure, most often used as Buddhist temples. 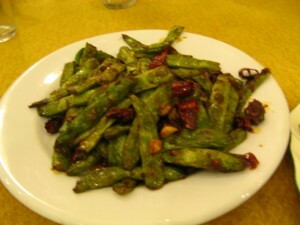 Food specialties for dinner were: Pork with peanuts, very HOT green beans, tofu & ham, herb tea, clear noodles & pork, green vegetable, Sticky rice desert balls.... The A Gon restaurant around the corner from the Sheraton Hotel on the pedestrian street (restaurant row) was excellent. Frequented primarily by Chinese families. Ludi Yan (Reed Flute Cave) Admission ¥45 ($5.50); in the slow season, ¥40 ($5) Located a pleasant 45-minute bike ride northwest of town, Reed Flute Cave, whose name derives from the reeds that used to cover the entrance and were used to make flutes, is the most impressive and most popular of Guilin's caves. Going first thing in the morning or late in the afternoon helps you avoid the overwhelming crowds. 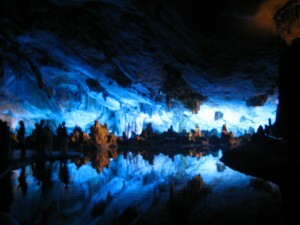 At any time, however, individual visitors may have to wait for a group of 20 or more tourists to amass before you can take the 40-minute tour of the cave -- and then only with a Chinese-speaking guide. The highlight is the cavernous Crystal Palace of the Dragon King (Shuijing Gong) with a dense collection of limestone mounds reflected in pools of water, all lit by hundreds of colored lights. Despite the blatantly tacky artifice of it all, most visitors can't help but gasp at the scene before them. This grotto is said to have been an air-raid shelter during World War II.